Village of Reminderville J.E.D.D. Scholarship available to Reminderville residents! Village of Reminderville > News and Events > Uncategorized > J.E.D.D. Scholarship available to Reminderville residents! J.E.D.D. Scholarship available to Reminderville residents! 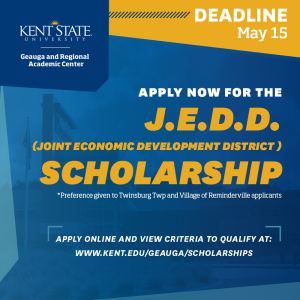 Apply now for the J.E.D.D. Scholarship for students pursuing a degree at Kent State Geauga with at least one class at the Regional Academic Center. Preference given to Twinsburg Township and Village of Reminderville.